A natural place to look for alleles of large effect are the otherwise conserved (from mouse through chimp) variants that are different in humans. See The Genetics of Humanness and The Essential Difference. My guess (without checking the paper to see if they report it) is that test-retest correlation for chimps is well below the 0.9--0.95 often found for (human) g. Thus the h2 = 0.5 figure reported below could be significantly higher if corrected for reliability. Nature News: Smart chimpanzees often have smart offspring, researchers suggest in one of the first analyses of the genetic contribution to intelligence in apes. The findings, published online today in Current Biology1, could shed light on how human intelligence evolved, and might even lead to discoveries of genes associated with mental capacity. A team led by William Hopkins, a psychologist at Georgia State University in Atlanta, tested the intelligence of 99 chimpanzees aged 9 to 54 years old, most of them descended from the same group of animals housed at the Yerkes National Primate Research Center in Atlanta. The chimps faced cognitive challenges such as remembering where food was hidden in a rotating object, following a human’s gaze and using tools to solve problems. A subsequent statistical analysis revealed a correlation between the animals' performance on these tests and their relatedness to other chimpanzees participating in the study. About half of the difference in performance between individual apes was genetic, the researchers found. In humans, about 30% of intelligence in children can be explained by genetics; for adults, who are less vulnerable to environmental influences, that figure rises to 70%. Those numbers are comparable to the new estimate of the heritability of intelligence across a wide age range of chimps, says Danielle Posthuma, a behavioural geneticist at VU University in Amsterdam, who was not involved in the research. I would be shocked if you could do cognitive tests on a monkey with very high retest reliability. Holding their attention is a bit more difficult than with humans! This contributes more noise to the g measurement and decreases the deduced heritability. Reliability is much lower when testing kids. But if they were very careful with the chimps perhaps they have a good measurement. Nevertheless, 0.5 is probably a lower bound. The second item is important in that most human have "working registers" for 7 items and the chimp seems to have 9 or more as the upper limit is not tested. "It's easy to test how much you can fit on this chalkboard. Just have a friend make a list of ten words or numbers. Read the list once, and then try to recall the items. Most people max out at seven or fewer. In Rabinovich and Bick's model ... Ten items requires inhibitory powers that are 50 times stronger"
Thus the chimp presumably with 10 or more 'working registers' is at least 50/15=3.3 times better than human in this particular 'human domain' task. The speed advantage seems to be at least another 4 times better. Since genetic experiment on chimp is probably 'less objectionable' (?) 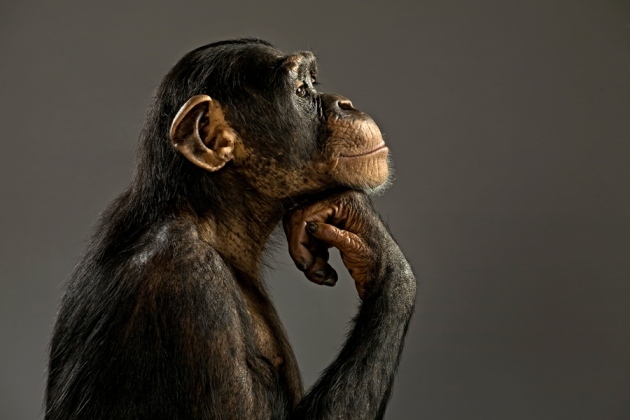 than that on human, the chimp with introgressed human 'cognitive genes' might be smarter than human. The scenario for Planet of The Apes is not a remote possibility. A fast and loose back of the envelope calculation. Assuming the overall advantage is the product of capacity and speed, the introgressed chimp is potentially about 13.2 times smarter than human, i.e.equivalent IQ of 1320, 1220 point above human average, i.e. 81.3 SD. So 30 SD would be comfortably within the potential range. With such potential, some country would be tempted to try it just in case another country would do so. "RISC concentrated on adding many more registers, small bits of memory holding temporary values that can be accessed at negligible cost (time). By providing more registers ... programs should run much faster. (Currently) the distinction between "complex" and RISC processor implementations has become blurred"
However ,the demand for mobile processor, low energy requirement and better heat disposal, RISC might be important again. I think culture has more of a role than genetics. I would like to see individual tribes of monkeys compared to other tribes with their own sets of social codes and languages. I suggest complexity of localised language and communication perpetuate the permission of environmental deconstruction in order to create modalities often associated with the concept of intelligence. But how do we know that....? "localised language and communication perpetuate the permission of environmental deconstruction in order to create modalities often associated with the concept of intelligence"
Is this Poe's Law in action or can this guy possibly be serious? If the former, well done sir, well done! I already asked the authors for their data. So far no response. But surely test reliability is unlikely to be as high in chimps as in humans, so heritability estimate is spuriously low. I would be surprised if it was not about the same as the human one. However, IIRC in their paper the amount of variation in overall cognitive ability explained by their "chimp g" was pretty low compared to human g. This might be an artifact of the battery of tests they use, but it does weaken their results a bit in my opinion. Or of their factor method. They are not very clear about it, which is another reason I want the dataset. If they used hierarchical, this means g is smaller (cf. Jensen and Weng 1994).